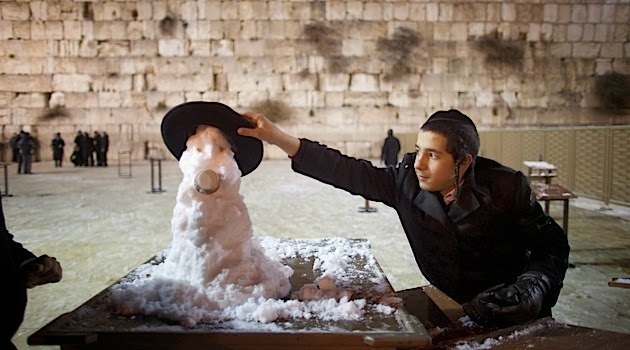 Now, normally I'd use this article about snow falling in Jerusalem to mock global warming. But boooooring, right? I know, right? It looks like a cow ate a lot of snow and it came out the other end and they put a hat on it. So I'm looking to create a fund -the snowman fund -where perhaps we could send Sally Struthers over to the Middle East to teach these poor ignorant people what a snowman is supposed to look like. For the price of a cup of coffee you can help teach these folks how to build a decent snowman. Please look into your hearts and wallets. When my kids were young we lived in Houston. They had never seen snow. A 2" snow in Houston caused the kids to get buckets, collect snow all over our block. They made a snowman just like this. Heroic effort!